Attributed to Eugene L. Holmes. See TEXT below. Albert J. Wright. See TEXT below. 1895-late-1930s Charles Lee Abell. See TEXT below. Albert Jay Wright was born in Oswego in 1858. His ancestors had come to New England during colonial days, and a forebear was Silas Wright, United States Senator and later Governor of New York. At eight Albert came with his parents to Buffalo where he attended P.S. 14 and Horace Briggs' Academy. He majored in science at Wesleyan, where he suffered an injury in a baseball game which cost him his sight. Returning to Buffalo in 1878, having married Gertrude Bent of Middletown, Connecticut, he went to work at his father's grain handling firm, Preston & Wright, which became P. Wright & Son two years later. In 1884 at twenty-six Albert was elected president of the Merchants' Exchange. Though blind, he was regarded as the dean of Buffalo stockbrokers. He was for years the only Buffalonian member of the New York Stock Exchange. As a result, his firm had the largest clientele of any brokerage house in Buffalo. It also had branches in Rochester, Syracuse, Niagara Falls, Bradford, Pennsylvania, and Toronto. He was a world traveler, an art enthusiast, and authority on matters monetary, which led him to publish in 1933 a novel entitled Red Demon, actually a treatise on the gold standard. In 1905 Wright, Gertrude, and their fifteen year old daughter enjoyed the services of an ethnically diverse staff of servants, two Japanese, two Irish girls, a Canadian girl, and a forty-year old French woman. In the stables lived two English coachmen with their families. 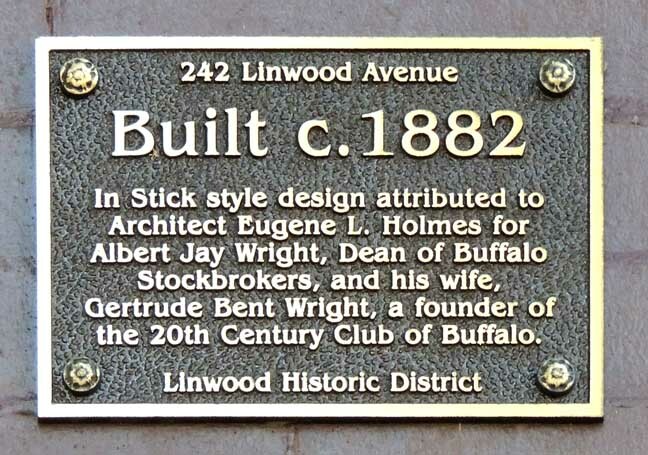 Albert Wright was an incorporator of the Country Club of Buffalo in 1889 and belonged to the Buffalo, Ellicott, and Yacht clubs of Buffalo and the Chicago Club. In 1931 Wright, by then over seventy and a widower, his wife having died in 1925, married in London Tatina Moslova, a young woman in her early thirties whose aristocratic family had fled Russia during the Revolution. The dramatis personae included the Lord Bishop of Norwich, the Earl of Albemarle, and the youthful and beautiful Princess Marie-Helene of Reuss. The wedding party then headed across town to a Russian church where an Orthodox ceremony was performed by Archbishop Seraphim of Paris, brought over for the occasion, before a second cast of supporting actors. Wright died in 1940 at eighty-one at his summer home at Cazenovia. The second owner, Colonel Charles Lee Abell, descendant of a Mayflower pilgrim, led the 74th New York Regiment in the Civil War and later served as president of the National Trust Company. The Abell family lived in the house until the late 1930s. During World War II the house was converted into two apartments on the second floor and doctors' offices on the first. 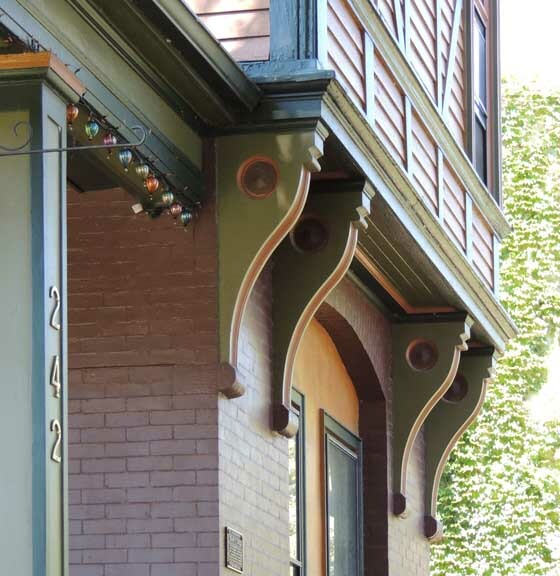 In 1986, restoration work began to return the house to single-family occupancy. In 1989, Ramona and Rik Whitaker became the new owners and continued the process. 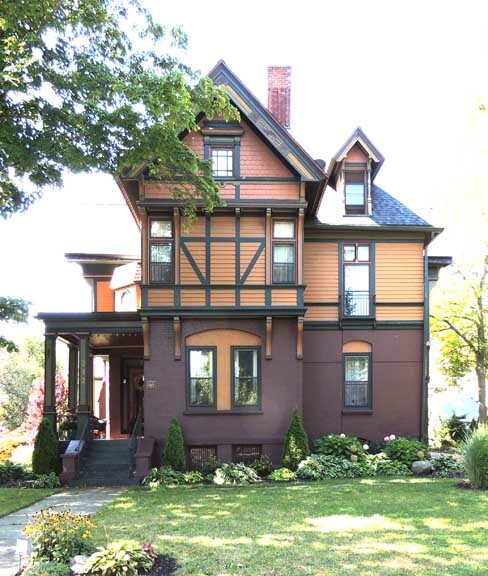 In March 1990, the Beau Fleuve Bed & Breakfast Inn, celebrating Buffalo's ethnic origins, was inaugurated. Exterior restoration and painting in rich authentic Aesthetic Movement colors were completed in the summer of 1994. Exterior lighting, landscaping, and additional improvements have followed. During W.W.II, the house was leased by the U.S. government and converted into two apartments on the second floor. Doctors' offices occupied the first floor. 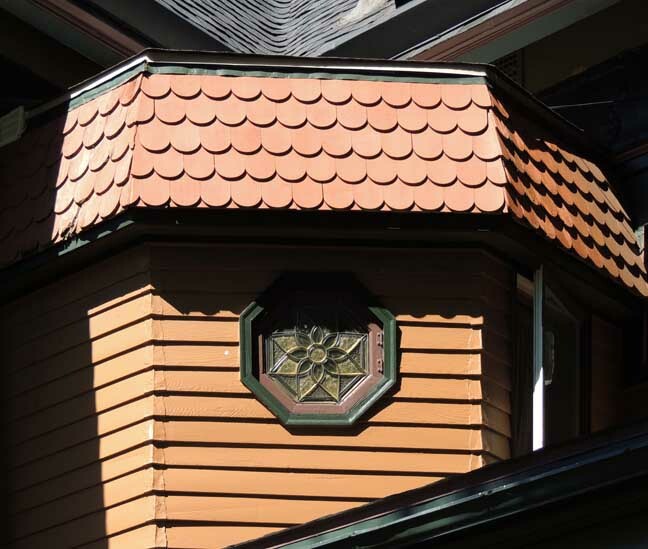 In 1986 a new owner began to restore the house to single-family occupancy. The present owners purchased the house in 1989 and have continued the rehabilitation In 1990 they inaugurated the five-guestroom Beau Fleuve Bed & Breakfast Inn, opening one room each year as restoration was completed. In May of 2005, it was the only bed & breakfast inn in Buffalo. In 1878 H.H. Little joined in a partnership with Eugene L. Holmes, an already established architect. The firm designed commercial, institutional and residential buildings. Their largest commission was the Fitch Accident Hospital (1881), a charitable emergency hospital at the southwest corner of Seneca and Michigan Streets. During its four years' existence the partnership designed a number of mansions on North Street. In 1882 Little struck out on his own, opening a practice at 31 White's Building. Special thanks to Rik & Ramona Whitaker, proprietors of Beau Fleuve Bed & Breakfast Inn, for their cooperation and assistance in 2004.